I used my 50mm lens instead of the 35mm (I’m talking effective focal length after accounting for the crop factor). While in Cuba, Oaxaca, and Portugal, the 35mm hardly ever strayed from the camera. But these are towns with narrow streets and intimate cultures. I think the 50mm may be better for places like downtown LA with its big wide streets and protective sense of privacy. I spent the better part of 3-days just photographing. I was in a groove where all I had to think about was photography. I hadn’t spent the better part of the day solving business problems. Slowly my mind wandered into that creative mode that I just don’t (can’t) show that much of at work. I worked alone. For much of the time I was on my own rather than shooting with other people. Although the safety of shooting can be prudent, shooting alone allowed me to wander more, linger more, and just plain not worry about if I was in someone else’s shot. As I hone my street photograph, I am thinking more and more about the relationships and layers. 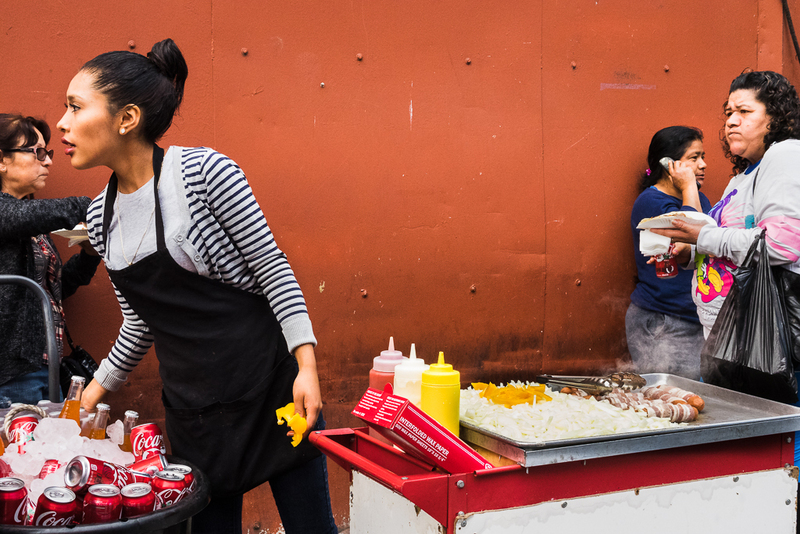 In this image, for example, I see this photogenic, active woman in a stripped shirt doing something fairly indicative of LA (these bacon wrapped hot-dog carts are everywhere). I immediately start to figure out what other elements I’m going to include in the scene. I’m looking to create some relationship between the elements of the image. Originally it was just the vendor woman and the woman on her phone on the right. Then the scene got messy, but I had the camera to my eye and was able to identify the moment when these four faces all aligned to a good composition. Nothing occluding, just the faces in proximity for a conversation, but not. Leg of Lamb, originally uploaded by I Nancy. Vendors at the Los Angeles Farmer’s market.